Although, it’s often assumed that Contempo Closets are built for clothes, there happen to be a wide variety of things you could store in our freestanding wardrobes that you don’t have to wear. For example, one of our preeminent designs, the Alpha 455, would perfectly house a television. While we normally leave TV display to our sister brand, Contempo Wall, the 455 would be an intriguing solution for anyone looking for a less obvious TV display that has the added benefit of two doors for easy concealment. Don’t forget, our closets all feature a wide array of custom design options, which means you could create as many shelves or separate compartments as you’d like. Are you thinking what I’m thinking? Contempo Closet’s wardrobe units make great display cabinets! Do you have a startling collection of china, precious antiques, or Star Wars collectibles that you love showing off for your guests, but might want locked away safely in the presence of pets or overactive children? A Contempo wardrobe is the perfect solution. Open the doors and place your valued collection in plain sight for your guests then close it up later to minimize any risk of damage. But the opportunities don’t end there of course. 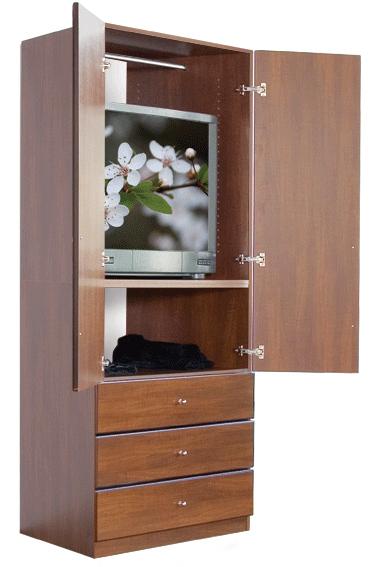 With custom designs and accessories, a Contempo Closet could hold pretty much anything you may want. What’s in your Contempo Closet? This entry was posted in Closet, Furniture, Organization, Storage and tagged antiques, Closet, clothes, collectibles, Organization, storage, TV. Bookmark the permalink.